Rilastil Aqua Normalizing Fluid is a face emulsion with a light, ultra-rapidly absorbed texture, containing active principles with moisturizing, rebalancing and mattifying properties. 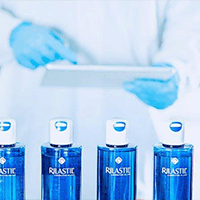 Rilastil Aqua is the complete product line for skin moisturization, in order to keep your skin fresh, tonic and to act against wrinkle. Rilastil Aqua Normalizing Fluid is a face emulsion with a light, ultra-rapidly absorbed texture, containing active principles with moisturizing, rebalancing and mattifying properties. It reduces over production of sebum on the T-zone, mattifies and gives back a perfect look to your face, by restoring the skin proper moisturization. INGREDIENTS: Aqua (Water) • Cyclopentasiloxane • Ethylhexyl Methoxycinnamate • Dimethicone • Cetyl PEG/PPG-10/1 Dimethicone • Propylene Glycol •Titanium Dioxide (Nano) • Nylon-12 • Sodium Chloride • Magnesium Sulfate • Mica • Triethoxycaprylylsilane • Alumina • Disteardimonium Hectorite • Polyester-1 • Silica Dimethyl Silylate • Glycerin • Propylene Carbonate • Amylopectin • Talc • Aluminum Hydroxide • Hydrated Silica • Alginic Acid • Polyglyceryl-10 Stearate • Inulin • Hydrolyzed Hyaluronic Acid • Sodium Hyaluronate • Hydrogenated Lecithin • Epilobium Fleischeri Extract • Ethyl Linolenate • Dimethicone/methicone Copolymer • Ethyl Oleate • Ethyl Linoleate • Sodium Lauroyl Lactylate • Citric Acid • Palmitoyl Tripeptide-5 • Ceramide NP • Ceramide AP • Phytosphingosine • Cholesterol • Xanthan Gum • Carbomer • Ceramide EOP • Phenoxyethanol • Ethylhexylglycerin • Sodium Dehydroacetate • Benzoic Acid • Dehydroacetic Acid • Potassium Sorbate • Tetrasodium EDTA • Parfum (Fragrance) +/- CI 77891 (Titanium Dioxide) • CI 77492 (Iron Oxides) • CI 77491 (Iron Oxides) • CI 77499 (Iron Oxides).